The Coconuts was the first Marx Bros. film (to be released) from 1929 and it is the most dated of their films. 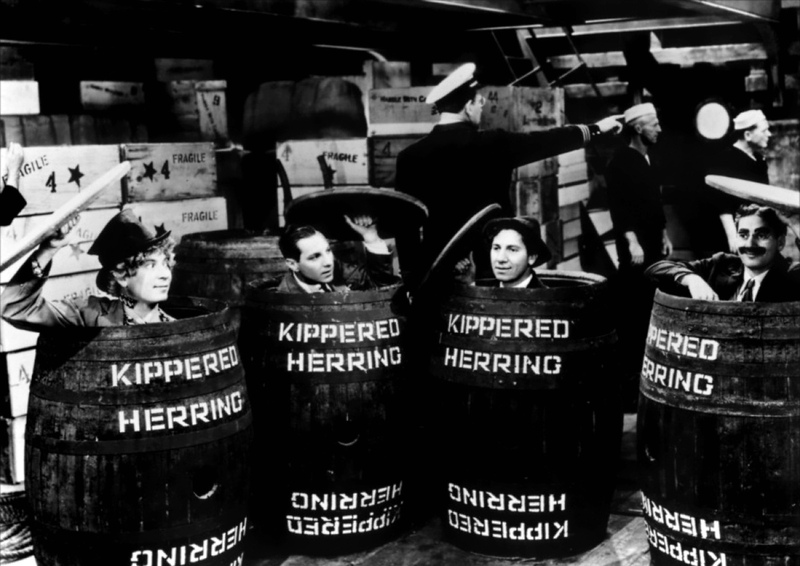 Whilst Groucho and Harpo are both in great form, and even Chico is funny, the movie is a bit bogged down by the elements that would bog down future Marx Bros. films, namely needless crooning of some very boring songs (by Irving Berlin) as well as Chico playing the piano and Harpo playing the Harp. These elements can almost be excused here as this was a remake of their Broadway play and looks to be exactly like a play that has been filmed. Zeppo is also in the film but does nothing much. 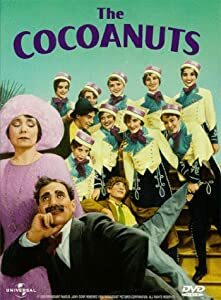 The Coconuts also has the ‘Viaduct’ scene with Groucho and Chico and lots of scenes featuring Groucho and his usual foil, Margaret Dumont, playing the wealthy dowager. Another this I feel should be noted is that the film is in very bad shape. I wonder what restoration Universal has done on the movie since they acquired it. Love Happy is notable for two things, 1) it is the worst of all the Marx Bros. films and 2) it features the screen debut of Marilyn Monroe. Groucho never appears on-screen with his other two brothers, while Chico looks very old (he was 62) and tired. There are some OK jokes with Groucho, and Harpo has a few good gags too courtesy of Frank Tashlin, who co-wrote the film. Although Harpo’s schtick does wear thin after 30 minutes. The best scene is the 2 brief minutes when Marilyn is on-screen with Groucho getting in a couple of good lines, but overall it is a terrible and terribly boring film. This 1939 Marx Bros. film starts off very slowly with one of those intolerable songs performed by someone not named Groucho. In this case it is Kenny Baker and Florence Rice who perform the mind-numbingly opening number. I wonder whether 1930s and 40s audiences really enjoyed these occasions when the Marx’s were not on the screen as I don’t. The same applies to Chico’s piano performances and Harpo’s harp recitals, which in At The Circus is tacked onto the politically incorrect Swingali number. It’s a wonder that the songs aren’t very good as they are written by Harold Arlen who composed the more memorable music to another movie in 1939, The Wizard Of Oz. These are all fast-forwardable moments and it is not until the 12 minute mark of the film that Groucho finally arrives, but when he does it is worth it. Lydia, oh Lydia, that encyclo-pidia. Beside it, The Wreck of the Hesperus too. And proudly above waves the red, white, and blue. up the hill comes Andrew Jackson. Oh Lydia The Queen of them all. Come along and see Buffalo Bill with his lasso. Here’s Godiva, but with her pajamas on. Here is Grover Whelan unveilin’ The Trilon. Over on the west coast we have Treasure Isle-on. for he went and married Lydia! We said Lydia, la, la! Lydia became one of Groucho’s signature songs. Overall the film isn’t one of the Marx Bros. best but it is still quite fun and worth a look. 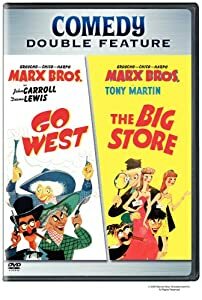 Any film featuring Groucho Marx‘s wit and Harpo Marx‘s slapstick and even Chico Marx‘s racial stereotype is always good watching. I used to be fascinated by the film when I was a kid, I actually set the video recorder to tape it late one night when it was on but unfortunately I missed the last five minutes of the film. Even back in the 80s you couldn’t rely on the TV stations to stick to their schedules. Grrr!!! It also features a lot of Groucho quipping with his favourite straight man Margaret Dumont and Harpo’s silly slapstick. It also features the stateroom scene, one of the funniest in all of their movies. Unfortunately this was also one of the first Marx Bros. films to feature a romantic sub-plot and the boring musical numbers that plagued the latter Marxist films. These are usually just some really boring 1930s ballads sung by some boring crooner or diva who are supposed to be the hero and heroine of the film. 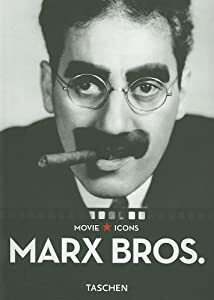 Anytime that someone who is not named Groucho Marx starts singing in a Marx Bros. film makes me grab the remote control for the DVD player. 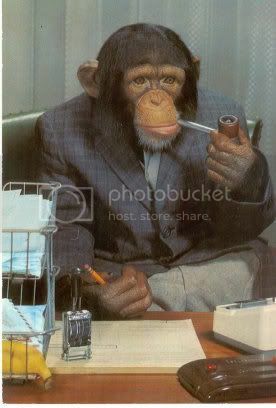 The same applies when Chico Marx starts playing the piano or Harpo Marx starts playing the harp. It takes a lot of effort to endure these pieces of tedium but the comedy on the other side is usually very funny and rewards the viewer with lots of laughs. It is interesting to note that the silent film comedian Buster Keaton (old Stoneface) wrote for this movie but is uncredited for it. The only real downer in the film comes in the last fifteen minutes when Chico has his obligatory piano recital and Harpo plucks the harp. Then again these things happen in all Marx Bros. films and one can always press the fast forward button. You can at least be thankful that there is no lame crooner taking up screen time from the Brothers’ antics, which would happen when they went to MGM. It is a great film although not quite as funny as Duck Soup. It’s currently available from Target for less than $10 and has just been re-released by Universal as part of their Studio Classics range. I finally watched this movie this morning. 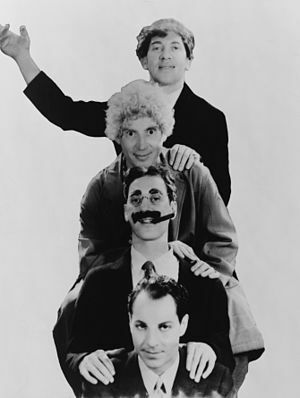 It was the last film that the Marx Bros. made together and it’s not their greatest of moments. The film does feature a fair bit of the Marx’s trademark humour but other than the hotel room scene, which drags on a little too long, there is nothing that they had not done in earlier films. There are no classic Marx Bros. moments here. The film is primarily about Nazis and stolen Jewish artworks that were hidden in the hotel Casablanca. The plot is a little disjointed and there seems to be a bit too much going on a lot of the time. The Brothers don’t really get too much time to do their gags justice, with the exception of the amusing hotel room scene that I previously mention. That’s not to say that it is a bad movie, it is still more entertaining than anything that Adam Sandler has made in the last decade or so. While it may not be as hilariously funny as Duck Soup or A Night At The Opera it is still very interesting and worth a look.